Nelsonville voters, including Democratic candidate Rob Jarvis, greet Rep. Steve Stivers in Ohio’s 15th District. I managed to get into the meeting by a fluke, and had a speech prepared. The meeting focused on what to do with the local prison after it closes. Every idea was about services for the addicted and their families, which is a good thing. Many offered good statements and ideas, and a damning and very good speech was given by Jack Frech. Taylor Sappington explained that it’s about money–we need a commitment of funds to get through the transition, and it may take years. Unfortunately, I was last in line (on purpose? ), and they closed it down just as I was up next. Time was up. 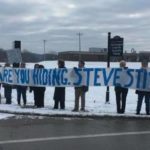 After the meeting, I confronted Stivers directly. I asked him why he hasn’t had a single public town hall, and why he only meets with people in private. He was angry, and started telling me about all of his tele-town halls. I told him that I have participated in those, and am never selected to ask a question. He told me that he will meet in private with any small group (ha!). I said our calls are never returned when we try to set up those meetings. Then he turned his back on me. I really wish I had a picture of his face. It was like when you realize the godzilla foot is going to stomp on you and there’s nothing you can do about it. Anyway, I heard chatter at the meeting about the protest outside. EVERYONE who attended saw the banner, and many honked and waved! Because it’s Athens County, and WE ARE AWESOME. Thank you to everyone who was involved today. You can follow Lori on Twitter to find out what District 15 activists are up to next.